One can't imagine how nervous Neil Patrick Harris must have been backstage in the moments before the official start of this year's Academy Award ceremony, but all those jitters obviously left the stage once the show began. How do we know? Because his opening number, titled "Moving Pictures," is absolutely fantastic. Check it out below! As seen above, Neil Patrick Harris certainly hasn't lost his singing chops. The host's opening number, brought to us by Time, paid tribute to the long history of movies through a lyric-driven tune paired up with a montage of clips from classic films - like the 1939 classic The Wizard of Oz, the feel-good Kevin Costner-led Field of Dreams, and everybody's favorite Patrick Swayze pic Ghost (okay, maybe our second favorite). They even gave a shout out to some of our bigger effects driven movies like Star Wars and The Avengers, which was pretty cool. And all of it had NPH superimposed over the iconic scenes. Whether you liked it or not, it's difficult to argue the actor/singer's ability to perform in front of a live audience. His songs may be a bit cheesy at times, but the man in-arguably hits all of the notes... which is why he's so often hired to handle these types of gigs. The number picked up some steam when Anna Kendrick of Into The Woods joined Harris in a bid to defend Hollywood, and also to subsequently retrieve her lost golden slipper. 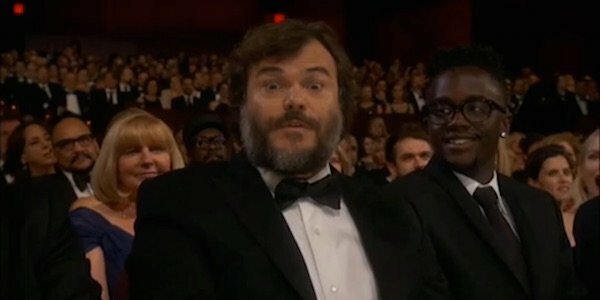 As good as the two paired up onstage, it was Jack Black who really lit things up, cutting in from his audience seat to drop some knowledge on the subject. This is what you sound like. Movies, movies, wow they rock. Once they did, but listen kid, it's all a big crock. Now it's market trends and fickle friends and Hollywood bologna. Believe me Neil, you're better off just polishing your Tony. I think we can all agree it was awesome. The only way Black's portion could have been better was if someone brought the man a guitar as he was most likely oh so desperately craving! Although the above video sadly cuts Black's portion of the performance unnecessarily short, it will remain in my brain for years to come. "Moving Pictures" was written by Bobby Lopez and Kristen Anderson-Lopez, the pair behind last year's Oscar-winning Best Original Song "Let It Go" from Disney's Frozen. With their and Harris, Kendrick, Black's talents combined, the writers and performers have certainly given fans a very memorable Oscar opening.